One of the few bright spots in retail has been the explosive growth of private label during this current recession. While private label has also grown during non-recessionary periods, the double digit increases of late has brought overall share to historic highs in the U.S. Individual chains, like Kroger, report that private label share is now in the high 20’s as a percent to sales and nearly 35% of units. •Major re-launches for private brands that have occurred this year include the massive packaging re-design and reformulation of Wal-Mart’s Great Value brand, which is the largest single private label brand in the U.S. Target also chose to replace its iconic “bulls eye” packaging in personal care and households products with the Up & Up brand, which is finding its way onto shelves now. •Stepped up media efforts include companies like HEB, Loblaws and Safeway running dedicated spots for their private brand programs. In the case of Safeway, brands such as Eating Right and O Organics are being sold outside to other retailers (shades of Loblaw’s Presidents Choice from years ago). The first evidence comes in the form of an old supermarket trick—the shopping cart comparison. In the old days, of course, the cart would be used to compare Store A against Store B and show how much cheaper they are. Now, we see a diverse group of retailers performing the same comparison, using private label and national brands. 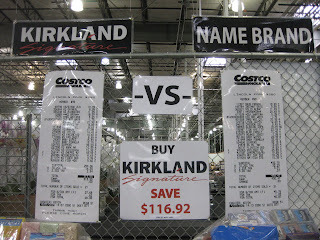 The photo to the right is Costco, which shows a whopping $116 savings on a $442 basket, nearly 30%. The fact that this is placed prominently at the front, after walking through a display of exclusively private label products makes the impact that much more powerful. 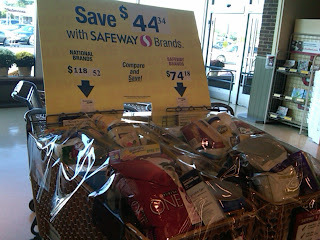 This picture is Safeway, which is offering a $44 savings, or over 35%, in their basket against national brands. They have also been aggressively marketing the quality of their private label with in-store POP materials. What happens when you don’t have national brands in your store? 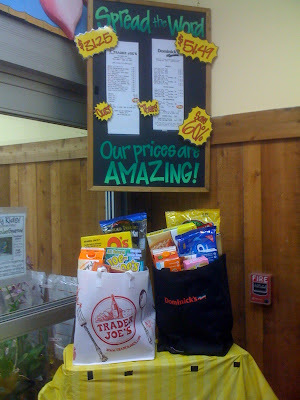 Trader Joe’s goes back to the tried and true of comparing against another retailer. This time, Trader Joe’s compares their basket of private label against Dominick’s (Safeway), as you can see from the image on the left. We did something similar last month. As part of a larger pricing study, we looked how private label prices compared across retailers. Now, we acknowledge that this isn’t the way a consumer shops (they compare private label to a national brand at the shelf) but we did think it would be interesting to see who has the lowest prices on private label, period. In a basket with 10 private label items (they can’t be called identical because they aren’t brands and are not the same), Aldi was 25% lower than Wal-Mart and nearly 80% lower than the two leader Chicago area grocers—Jewel and Dominick’s. Finally, Consumer Reports recently weighed in, asserting that a number of private label products did as well or better than the brands in their tests. As private label becomes more mainstream, it puts pressure on the retailers to deliver products that deliver on the promise and national brand manufacturers to fight back with real innovation while ensuring that the value remains. One thing is certain—the battle of private label versus national brand has been elevated to a very public status.